When we originally launched the monthly budget graph, it simply shifted the perspective of your income. These past few weeks, we started looking at Cushion and asking questions we’d find ourselves wondering as freelancers. Am I on track for the year? Did I earn as much as I needed to this month? We quickly realized that there’s so much more we could do with the monthly view. Previously, Cushion used a single line to indicate your monthly goal, but if you fell short one month, the next month’s goal would remain the same. 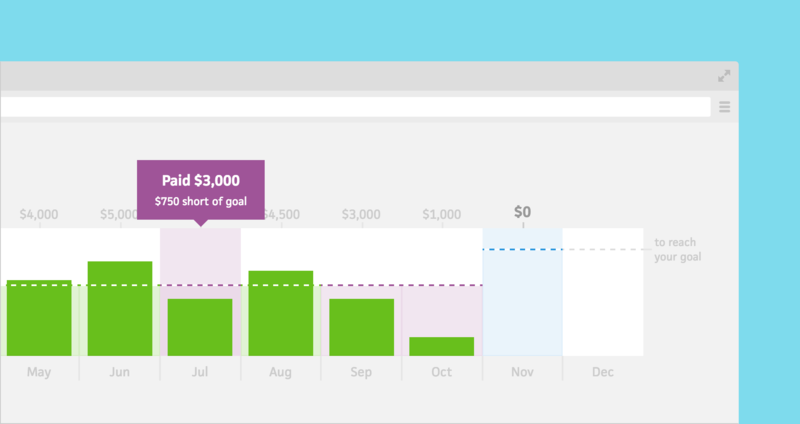 Now, Cushion adjusts your monthly goal to make sure you’re on track for the entire year. For past months, Cushion will highlight whether you reached your goal or not. Hovering a month will show the difference. In the near future, we plan to use this data to indicate your best/worst months. In the graph settings, you can now specify which goal you want to target. By default, Cushion will automatically detect your next goal as it did before, but if you’re like me and prefer to aim for your target goal instead of your minimum, you can. Lastly, we improved the accuracy of estimated income by spreading it over the projects’ schedules. For example, if a project spans three months, Cushion will divide its estimated income across those three months. If a project isn’t scheduled, Cushion won’t show its estimated income in the monthly graph. We hope these improvements go a long way to help you forecast your year. Let us know what you think and keep an eye out for more updates!